What does it take to become a LinkedIn WINNER? Although there’s more to creating a great presence on the network than merely creating a profile and leaving it to work it’s magic, ensuring that you fill your profile out fully and sell yourself in the best possible way really can make a difference. Whether you’re looking for a new job, seeking out new business or just trying to maintain a strong professional network, it pays off to look after your personal brand on LinkedIn. 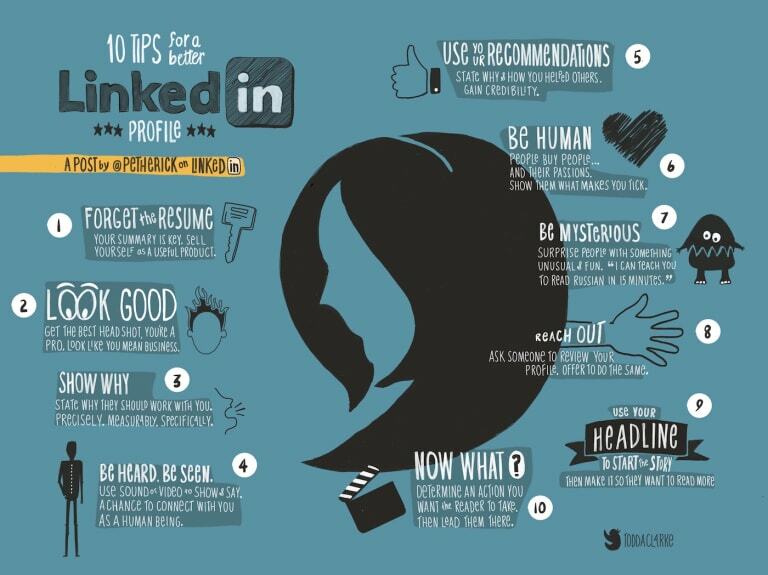 This infographic by Todd Clarke gives 10 tips for a better LinkedIn profile that will capture people’s attention! Your summary is key to capturing people’s attention when they visit your profile. Keep it short and sweet, highlighting your best qualities, skills and experience. Treat it as an elevator pitch telling the reader the essentials that will present you in the best light. It’s a professional network, so keep your photo exactly that. No holiday snaps on the beach or photos from a night out with a drink in your hand – save these for Facebook. Choose a high quality image that represents you as a professional. Let the reader know exactly why they should work with you and what you can deliver, measurably and specifically. Add media to your profile. Sound and video will stand out and can help people to connect with you more as a person. Use specific examples of how and why you have helped others. Ask them to provide recommendations on your profile to add credibility. People don’t want to work with robots, they want to work with real people, with real passions and interests. Don’t be afraid to show that you have a personality. Surprise people with an unusual skill or interest that will make you stand out from the crowd. Reach out to your connections and other people on LinkedIn. Ask someone to review your profile and offer to do the same. Your headline is the first thing that people will see, so make sure it grabs their attention. It should be you in a nutshell, so your job title and company/industry could work, or alternatively something more quirky could do the trick. What do you want to achieve from your presence on LinkedIn? You can use this objective to tailor your profile and create a plan of action for how you wish to utilise the network, from expanding your network, to getting spotted by a recruiter.